After hearing about Dinoâ€™s on my favorite pod cast Good Food with Evan Kleinman on www.kcrw.com I decided to take an early lunch and check out their Los Angeles location located at 2575 West Pico Blvd. 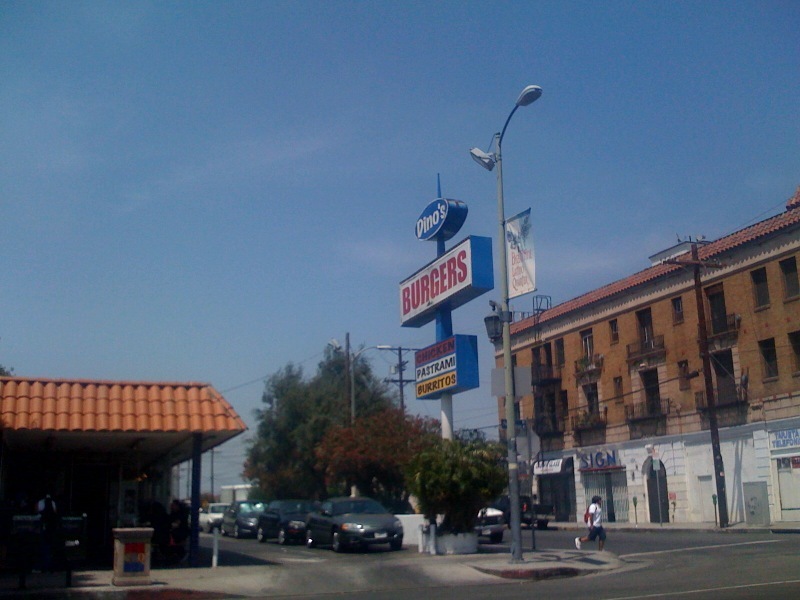 Los Angeles, Ca 90006. Itâ€™s in a neighborhood called the Byzantine Latino Quarter that is dotted with historic storefronts and what looks to be some very promising restaurants and food stands.Â As I drove down Pico looking at the street numbers I suddenly saw plumes of smoke wafting across the street. 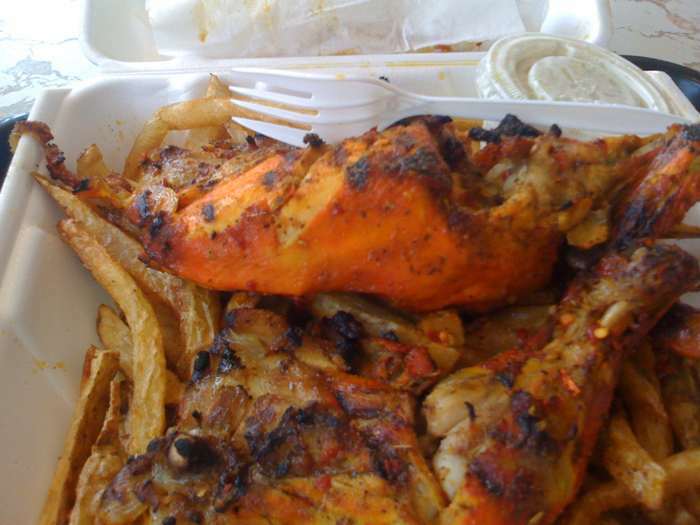 As I drove through the smoke the intense smell of grilled chicken hit me and I knew that I had found Dinoâ€™s.Â I was really hungry so that smoke had me jogging into this joint with the formica covered tables. 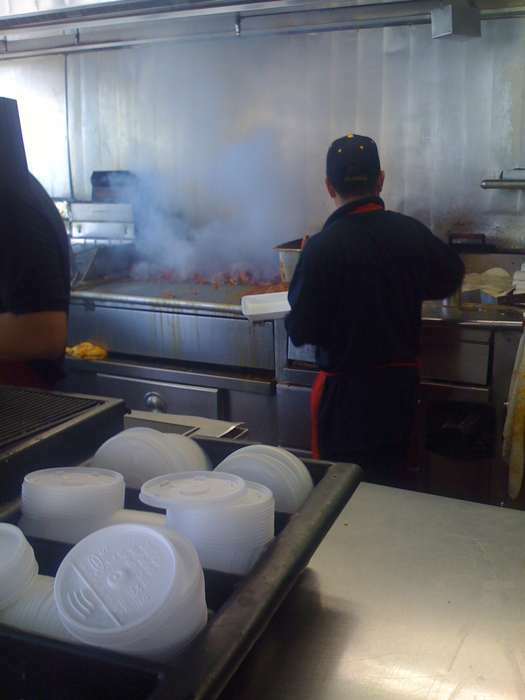 As I approached the counter to place my order I saw stacks of orange marinated chicken waiting to be thrown on a smokey flaming hot grill. I placed my order. Chicken plate please. Six bucks. As I waited I watched the grill master throw on half chickens and move them around with long tongs. Ever so often he would douse the flames with a wet brush of marinade. It was awesome. I watched them grab a Styrofoam box and place a heaping amount of French fries. They then topped the fries with the hot half chicken. They once again doused it with the marinade, placed a container of coleslaw in the corner, and topped it with a couple of tortillas. I sat down at one of the old formica tables and ripped into the chicken. It was so tender and juicy that a knife was not needed. The marinade is a mixture of vinegar, red pepper flakes, garlic, oregano, and possibly paprika because of the color of the chicken. It is just delicious. And it doesnâ€™t stop there the juices from the chicken are soaked up by the French fries below which makes a great side dish. The only way to sum up Dinoâ€™s is really good and cheap. You are currently browsing the SimpleFoodie.com weblog archives for May, 2009.